Just before Gamescom took place, Nvidia dropped a HUGE announcement unveiling their new RTX 20-Series cards. They showed off their new Raytracing feature on several games, predominantly the new Shadow of the Tomb Raider game which dropped a few days ago. Since then there has been a lot of speculation about the performance and difference from the 10-series but now the RTX graphics driver has just been released recently allowing reviewers to start testing these new cards. With that, the RTX benchmarks have also been leaked online. 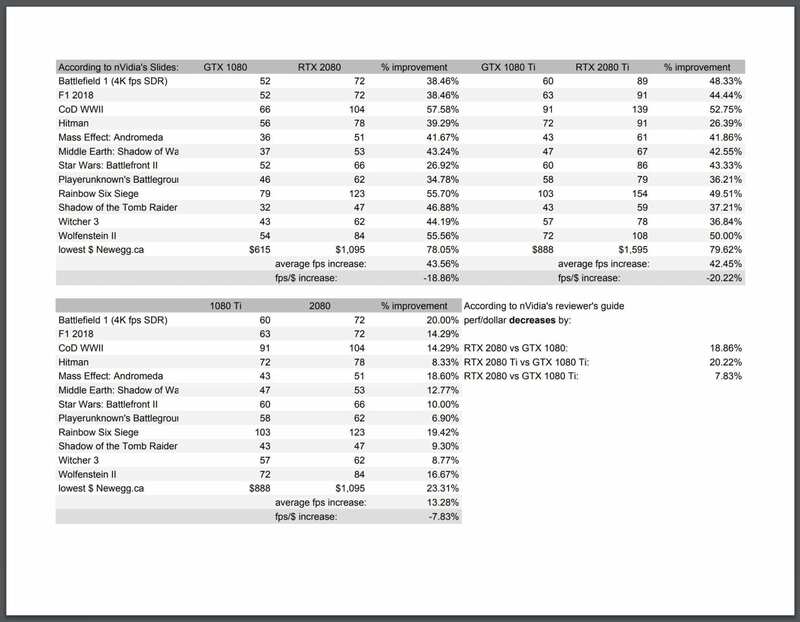 In addition, a Reddit user posted a more detailed picture showing the performance improvement rate of the new graphics card. The picture also provides FPS / $ cost-effective rate. It can be seen that the RTX 2080 (Ti) has a performance improvement, but the price is much higher. If you look at the cost/performance the price is actually reduced! (2080 is 18% lower than 1080, 2080 Ti is 20% lower than 1080 Ti, and 2080 is 7% lower than 1080Ti.) It should also be noted that these are launch prices and they could be very different in 6 months but right now the performance difference roughly justifies the price difference. The future definitely looks bright (with variable rate shading) for Nvidia’s new RTX 20-Series line! While many gamers will moan about the price, the advancement of this technology can only look to serve the gaming community. I’m excited to start testing some of the new cards so keep an eye out for our reviews when we push the new cards to their max! Previous articleShadow of the Tomb Raider review – The latest GOTY contender!